Fifty percent of the student body receives financial aid from the college, with awards ranging from $2,100 to $61,000, depending on their family’s need. The vast majority of Williams aid comes in the form of grants, which averaged around $46,000 per aided student this year. Your financial need will be met through some combination of a Williams grant; campus job; loan; and other state, federal, and private funds. 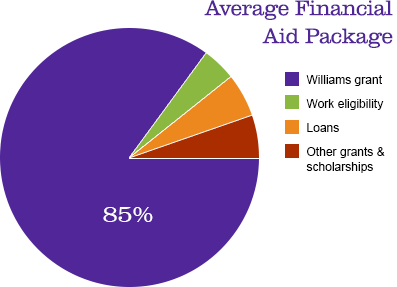 On average, a Williams grant covers 85 percent of a total financial aid package. Williams provides no-loan financial aid packages to families with incomes up to $75,000 with typical assets. Note that you’re not required to accept a job or loan offer to receive a Williams grant.